BMW’s iconic Small Car brand has been expanding rather rapidly as of late, by adding a 2 seat coupe and Roadster, the Clubman Wagon, the Countryman Crossover and the upcoming Paceman. Mini is showing no signs of stopping; they created quite a stir earlier this year at the Geneva Auto Show when they pulled back the curtains on the Rocketman, a quirky yet lovable concept that embodies everything a Mini is supposed to be. The Rocketman is about a foot shorter than the standard Mini hatch, so its dimensions are closer to that of the original mini, but it also combines the modern elements of the brand. 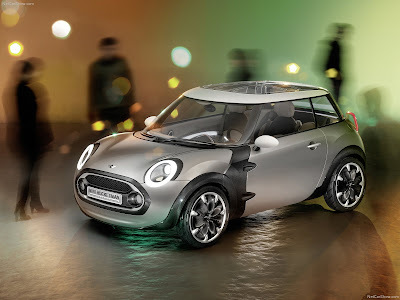 Public response on the Rocketman was so positive that BMW green lighted the car almost immediately, this is where the problem lies, the R56 MINI Platform is engineered for small or compact vehicles, and the Rocketman is a an A-Segment car. For some reason probably cost cutting the extensive use of carbon fiber has been foregone for the production version, replaced by Steel. Rumor has it that original prototypes of the car, riding on a chopped version or R56 ran into weight problems, due to the Rocketman’s size, this left BMW with a car that had no platform. Instead of going back to the drawing board and developing a new platform which would have cost them a pretty penny, BMW has reportedly looked to Toyota to supply a platform. It may be possible that the Rocketman will be underpinned by the same platform that carries Toyota’s Aygo, and its Citroen and Peugeot cousins. Unfortunately this potential platform change could mean the end product could have a higher msrp, because more R&D would be put into keeping the Rocketman’s shapely form. But the Rocketman isn’t the only MINI in the news lately, as reports indicate a cargo variant of the Clubman, a successor to the last cargo MINI, which left the market in 1982. The transformation will be very simple; the rear glass will be replaced with metal, like almost all other cargo-ready vehicles. Rumor has it the MINI Cargo will also feature some exterior details to set it apart from its standard variant. The car is rumored to bow along with the production Rocketman at Geneva.